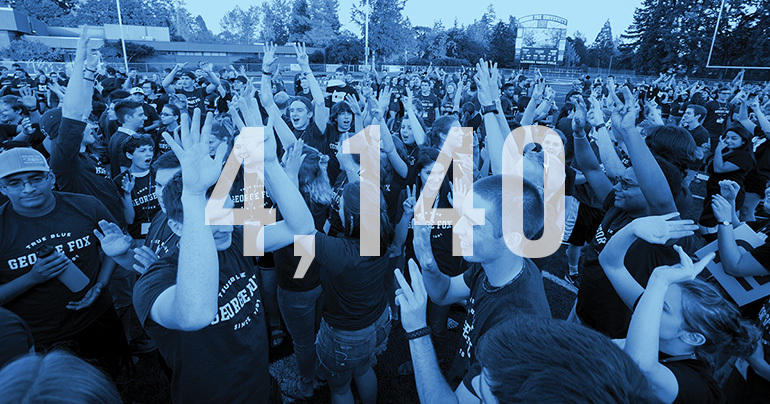 For the first time in its 125-year history, George Fox broke the 4,000-student mark with 4,140 enrolled this fall, including 2,707 undergraduates and 1,433 in graduate programs. The total eclipsed last year’s enrollment of 3,931. In all, it’s the fourth year in a row and the 27th time in 30 years that an enrollment record has been set. The record-breaking year continues a trend of significant growth over the past three decades, with overall enrollment increasing more than sevenfold since 1986, when 549 students attended. To further put recent numbers in perspective, this year’s incoming class of 767 new or readmitted students is 40 percent higher than the total student population was 30 years ago.